$25 maximum charge in 24 hour period. Each extra day $25 or part there of no hourly prices apply. *Daily price applies to 24 hour period or part thereof. Failure to vacate car park within 20 minutes will result in additional fee being charged. There are a number of car hire companies that service Karratha Airport. Rental Cars customer service desks can be found opposite the baggage carousels in the Arrivals area of the Terminal. If you would like more information about taxi services in Western Australia or would like to give feedback about your taxi journey, please visit the Western Australian Department of Transport website. Please take note of the taxi license plate and driver numbers, and the date and time of your journey. Parking for large buses with more than 22 seats and oversized vehicles is available in the designated bus and oversized vehicle parking area as identified on the above map. Time limit applies to the parking area. Access to the terminal for passengers is via the pathway along Norman Road. For safety reasons, please direct your passengers to use this path. Walk time to terminal is approximately 3 minutes. Only coaster buses (11 and 22 seat buses) will be allowed into the designated pick-up and drop-off zone at Karratha Airport in front of the terminal. A proximity card and permit is required for buses wanting to use this lane. Proximity cards and permits are available from the airport office upon completion of the attached form and payment. Access to the pick-up and drop-off zone for coaster buses is via Goddard Street and is identified in blue on the attached map. If no bay is available in this zone, drivers must continue through and park in the designated bus parking area. Blocking of car park roads and entries will not be tolerated and infringements will apply. Coaster buses must turn engines off once parked in the pick-up and drop-off zone. Any breaches of the Conditions of Use will incur an infringement and possible revocation of proximity card. Lost proximity cards are to be immediately reported to Karratha Airport administration. A completed statutory declaration is required when reporting lost cards. 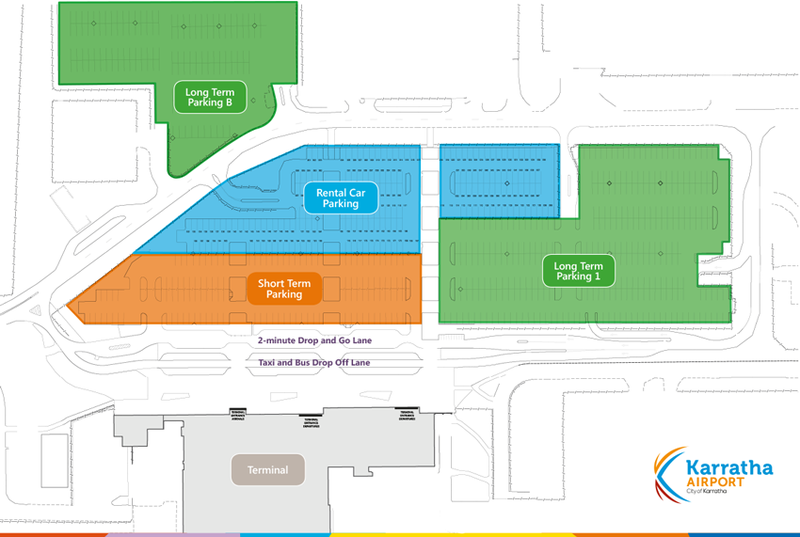 Fees will apply to accessing the coaster bus drop-off and pick-up zone. The fees are set in the City of Karratha Fees and Charges and may change at any time. Please note that unused credit is non-refundable. The fees are set in the City of Karratha Fees and Charges and may change at any time. Each permit allows provision of a proximity card for use in the coaster drop-off and pick-up lane. The amount charged to the card and the remaining available is displayed when tagging out at the exit. Cards can be topped up at any auto pay station. Permits are allocated to a vehicle registration and are not to be shared amongst vehicles. Offenders will face revocation of permit and airport access. Permit applications are processed on Mondays, Tuesdays and Fridays only at the Karratha Airport office. Payment can be by EFTPOS, Credit card or cash. Payment must be made prior to issuing of proximity card and authorised bus parking sticker. Where multiple permits are held by a company, an invoice can be prepared. Please consult the Airport Commercial Manager to request invoice account. Permits and proximity cards remains the property of the City of Karratha and must be returned upon cessation of operation. It is an offence to bring or consume alcohol at Karratha Airport except where the facility is licensed under the Liquor Control Act 1988. Any driver found to supply alcohol for consumption by them or their passengers, or supply on behalf of a passenger within the airport boundary will face immediate removal from the airport and be reported to Police.